HEADLAND Machinery has introduced the new Spectrum coordinate measuring machine (CMM) by Carl Zeiss Industrial Measuring Technology. 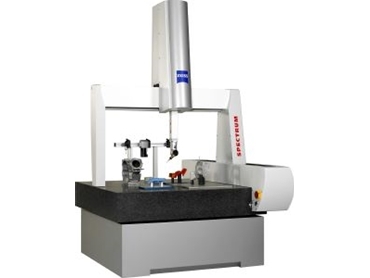 This new bridge-type CMM was designed to meet the market's demand for an economical, high-performing CMM with sensor upgrade capability. Spectrum covers a wide range of applications and gives users access to a variety of Carl Zeiss and Renishaw probing technologies. Equipped with the RDS (rotary dynamic sensor) system, Spectrum can measure extreme complex geometries. The RDS articulating probe offers ±180° of bi-directional rotation and permits indexing steps of 2.5° reaching 20,736 individual positions. With the ViScan optical probe and the DTS non-contact trigger probe, the operator can perform optical measuring tasks in all directions. Spectrum models offer X, Y, Z measuring ranges from 700 x 700 x 600mm to 1000 x 2100 x 600mm. A raised bridge option, available with the 1000mm models, increases the effective Z-axis measuring range to 780mm. Ceramic guideway technology provides high stability against temperature changes and all dynamic influences. The machine's accuracy of up to MPEe 2.5 + L/250 is guaranteed over a temperature range from 18° to 24°C (64-75°F). Spectrum is equipped with a C99 ISC (intelligent scanning controller) that permits future upgrades to scanning probes. Dual graduated-control joysticks offer precise control of the 3-axis movement. The variable speed control feature changes or pauses CNC program measuring speed which aids during program verification. Zeiss wrap-around patented air bearings in all three guideways provide rigidity and stability at maximum speeds and accelerations. Spectrum is available with Windows-based Calypso CAD software. Calypso can be combined with Holos, designed for the measurement of 3D surfaces and Dimension, a software designed for reverse engineering tasks.